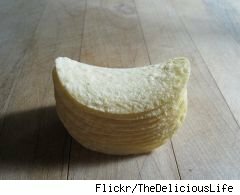 The Food and Drug Administration has asked Procter & Gamble to recall two flavors of its Pringles chips due to possible Salmonella contamination. The chips are just the latest snack food to be recalled due to a flavor enhancer called Hydrolyzed Vegetable Protein, or HVP, that is used in a wide range of products and is tainted with Salmonella. The two Pringles flavors being recalled are the Restaurant Cravers Cheeseburger (Super Stack Canister: 181 grams, UPC code: 37000 26936, with best by dates of 02/2011, 04/2011) and the Family Faves Taco Night (Super Stack Canister: 181 grams, UPC code: 37000 26773, with best buy dates of 03/2011, 04/2011, 05/2011). P&G is the latest company to recall products with HVP. And as WalletPop's Consumer Ally columnist Mitch Lipka has reported recently, It likely won't be the last. Of particular concern is that the shelf-life of many of these products, such as dry soups and snack foods, means that many consumers already have them in their pantries and may not realize they've been recalled. Anything with a "best by date" of 2011 should be considered suspect. The FDA keeps an updated list of recalled products involving HVP here.